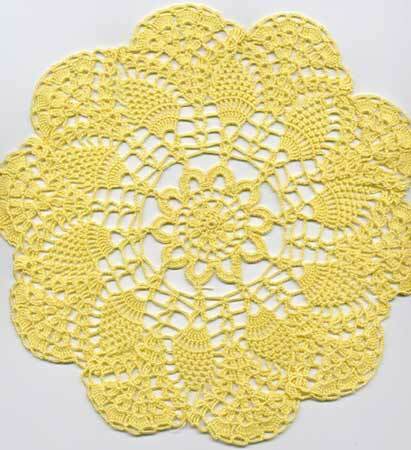 Comments: First of two pineapples doilies I designed in last month....I like this design! 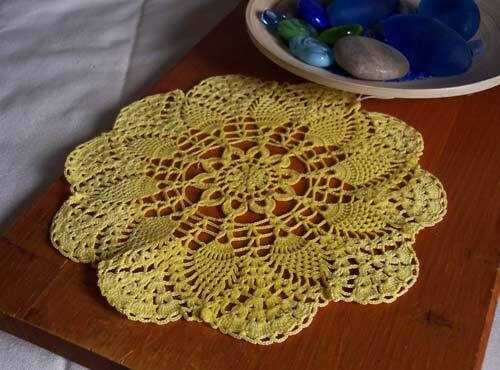 This is clearly inspired to old traditional American doilies. 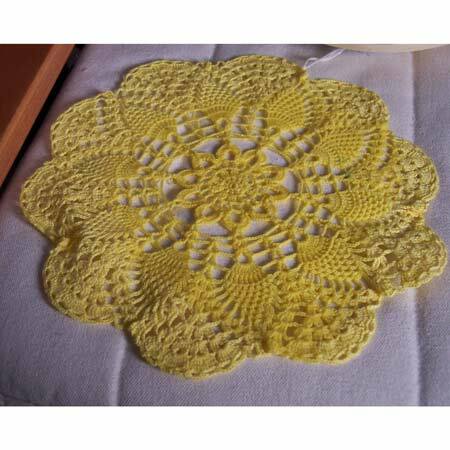 Not difficult, a little bit tricky if you use thin thread. trsh= tr shell = (2 tr, 2 ch, 2 tr) in same sp. 1. 10 sc in lp; join with sl st in first st. 2. *(sc in sc, 1 ch)*; Repeat from * to * 9 times more; join with sl st in first st. 3. *(dcl on sc, 3 ch)*; Repeat from * to * 9 times more; join with sl st in first st.
4. *tr on dcl, 3 ch, tr in 3-ch sp, 3 ch*; Repeat from * to * 9 times more; join with sl st in first st.
5. sl st in 3-ch sp, *sc in 3-ch sp, 12 ch, sk a sp*; Repeat from * to * 9 times more; join with sl st in first st.
7. Join thread in 3-ch sp, *(dc, 3 ch, dc) in 3 ch sp, 13 ch*; Repeat from * to * 9 times more; join with sl st in first st.
8. sl st in 3-ch sp, *(2 tr, 3 ch, 2 tr) in 3-ch sp, 6 ch, sc in 7th ch of 12-ch sp, 6 ch; *Repeat from * to * 9 times more; join with sl st in first st.
9. sl st in 3-ch sp, *(2 tr, 6 ch, 2 tr) in 3-ch sp, 4 ch, (dtr, 3 ch, dtr) on sc, 4 ch*; Repeat from * to * 9 times more; join with sl st in first st.
10.sl st in 6-ch sp, * 9 tr in 6-ch sp, 4 ch, (dtr, 3 ch, dtr) in 3-ch sp, 4 ch*; Repeat from * to * 9 times more; join with sl st in first st.
11. * (tr on next tr, 1 ch) 9 times, 3 ch, (tr, 3 ch, tr) in 3-ch sp, 3 ch*;Repeat from * to * 9 times more; join with sl st in first st.
12.sl st in first ch sp, *(sc in next sp, 3 ch) 7 times, sc in last 1-ch sp, 4 ch, sk a 3-ch sp, (2 tr, 2 ch, 2 tr, 2 ch, 2 tr) in next 3-ch sp, sk a 3-ch sp, 4 ch*; Repeat from * to * 9 times more; finish with sc in first 3-ch sp. 13. *(3 ch, sc in next 3-ch sp) 6 times, 4 ch, (trsh in next sp) 2 times, 4 ch*; Repeat from * to * 9 times more; finish with sc in first 3-ch sp. 14. *(3 ch, sc in next 3-ch sp) 5 times, 4 ch, trsh in next 2-ch sp, 2 ch, dc cluster pointing the hook between the two shells in Round 13, 2 ch, trsh in trsh, 4 ch*; Repeat from * to * 9 times more; finish with sc in first 3-ch sp. 15. *(3 ch, sc in next 3-ch sp) 4 times, 4 ch, trsh in trsh, 2 ch, (dcl, 2 ch, dcl) in dcl, 2 ch, trsh in trsh,, 4 ch*; Repeat from * to * 9 times more; finish with sc in first 3-ch sp. 16. *(3 ch, sc in next 3-ch sp) 3 times, 4 ch, trsh in trsh, 2 ch, [(dcl, 2 ch, dcl) in next dcl, 2 ch]2 times, trsh in trsh,, 4 ch*; Repeat from * to * 9 times more; finish with sc in first 3-ch sp. 17. *(3 ch, sc in next 3-ch sp) 2 times, 4 ch, trsh in trsh, 3 ch, [(dcl, 2 ch, dcl) in next dcl,3 ch]4 times, trsh in trsh,, 4 ch*; Repeat from * to * 9 times more; finish with sc in first 3-ch sp. 19. Join thread in a shell just before a pineapple, * trsh in trsh, picot, trsh in next trsh, 5 ch, sc in first tr of next grp, 5 ch, + (sc in 5th tr of same grp, 5 ch, sc in next single tr, 5 ch)+ Repeat + to + twice, sc in 5th tr of last grp, 5 ch, sc in last tr of same grp, 5 ch*; Repeat from * to * all around, join with sl st in first tr. Cut thread, weave in ends.